On Mondays, you'll find gobs of locals garbed in yellow polo shirts to show support for the King. 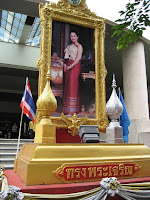 In front of many buildings you'll see large portraits of the King or the Queen; on occasion, the pair posing together. Today I went to the Central department store right near the hotel. Actually I go to the Food Hall often for lunch; I dubbed it the "Whole Foods of Thailand." When I was wandering the third floor, a crowd of people started to gather and security roped off the area. A sea of people passed by and everyone bowed their heads in respect. I had no idea what was going on but it turned out the Queen ("Lady King," one saleswoman explained) and her minions just passed by me. She was dressed in a parakeet yellow suit and was going to the International Watch Fair. My brush with royalty.